Time slows in Vitznau, as the sun begins to set over Lake Lucerne (der Vierwaldstädtersee). Our host for dinner turns positively misty-eyed as we watch the sun dips behind clouds and mountains across the lake. Sunset is the big event here, he tells us, and each one is unique. After just two evenings here, Tom and I agree that it is a show worth watching. 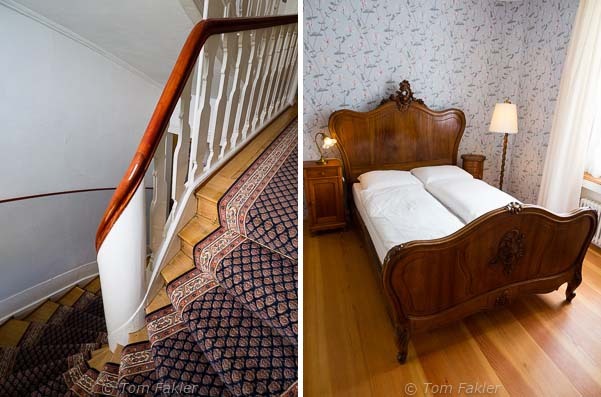 We felt at home even before we arrived at Hotel Terrasse am See, when Pia and Roland Scherrer-Nussbaumer wrote to us, asking about our interests and offering ideas for exploring Mount Rigi. These hotel owners are happy to share their passion for the hotel and Swiss history with their guests. 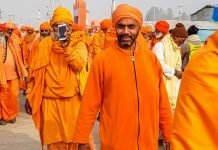 Their personal attention throughout our stay just added to our enjoyment. 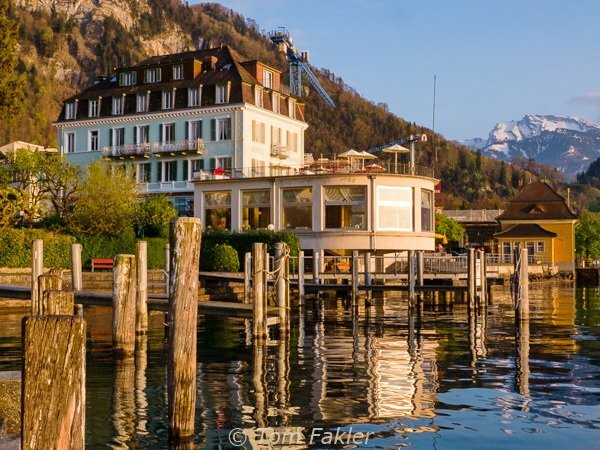 The Hotel Terrasse am See is spectacularly situated, and dates from the earliest days of railway service to Mount Rigi. Built in 1873 as the Hotel Pension Rigi-Bahn, the hotel has weathered several incarnations and name changes. The latest, Hotel Terrasse am See , is a perfect fit! Hotel Terrasse am See is flanked on one side by a little lakeside park, and on the other, the boat landing and the valley station of the Vitznau-Rigi train. In spring, flowers splash color around the tiny Kurpark near the hotel. 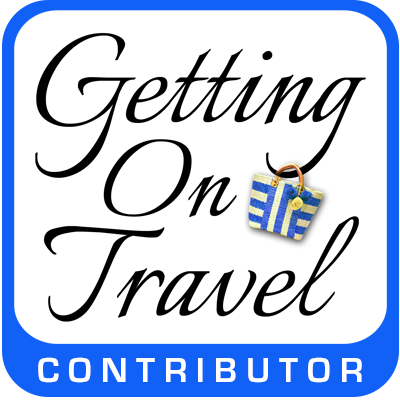 Owners Pia and Roland Scherrer-Nussbaumer have lovingly restored the hotel over the last several years, adding period pieces to the interior, and making sure creature comforts are there, as well. 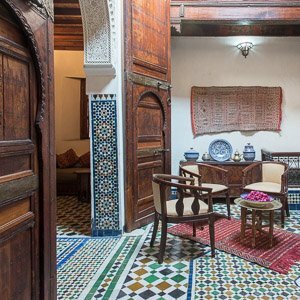 The result is a hotel filled with warmth, character and atmosphere. 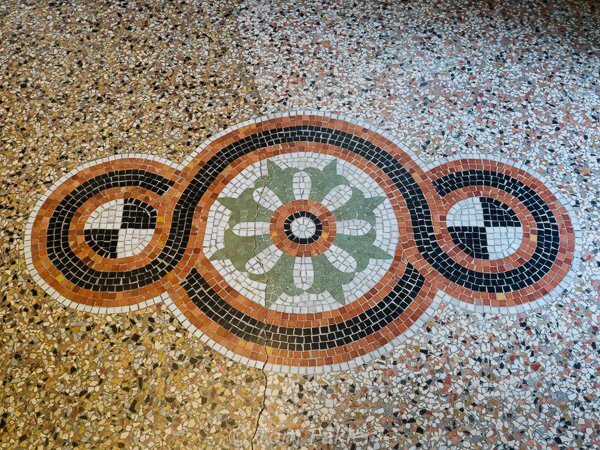 Restoration of the hotel’s entrance hall revealed a terrazzo floor with mosaics. Overhead, a contemporary alabaster light installation by David Szarka of Lucerne beams guests into the hotel. Near the entrance, a dining room for private events–the hotel’s former Smoking Room–sports furnishings and a chandelier from the same era as the original hotel. 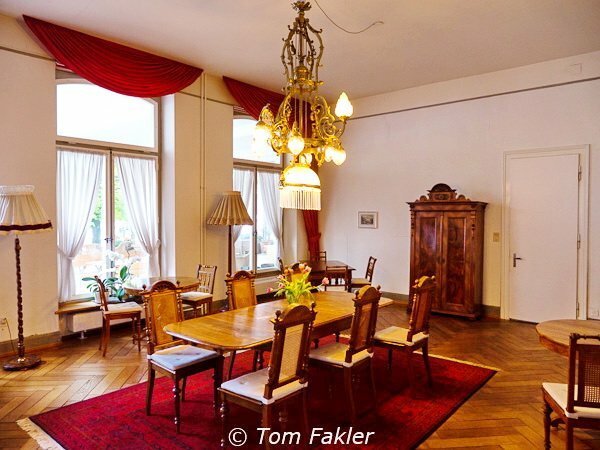 The sitting room with planked parquet flooring offers old-fashioned family entertainment with books, games, maps, even an upright piano. 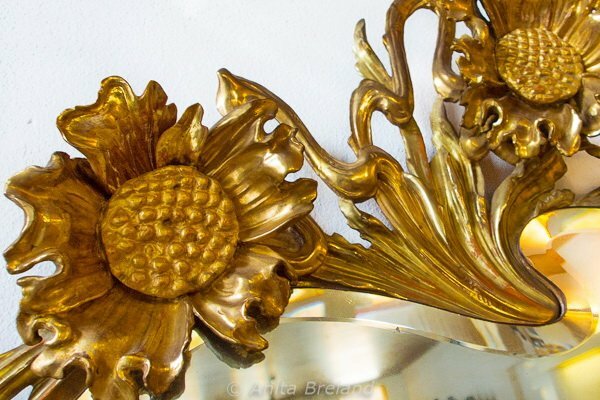 Swiss artisans have been engaged for the restoration, such as this reconstruction for a period mirror in the sitting room by Aargau-based wood carving specialist Sonja Bantli . The hotel’s interior was extensively renovated in 2011/12. Many rooms now feature restored parquet floors, historic furniture and wallpaper, and color schemes in keeping with the past. 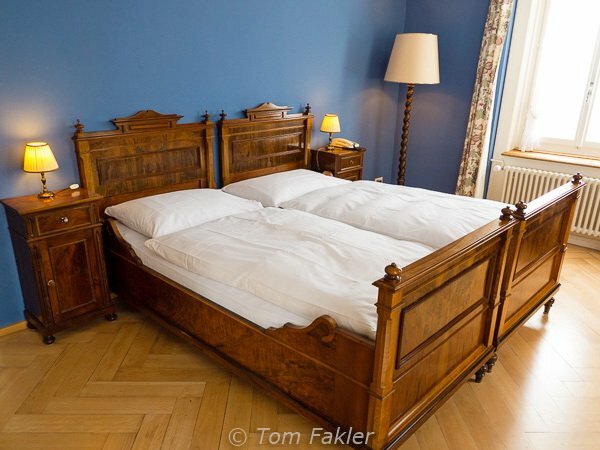 The beautifully restored bed in our room came from Haus Toggenburg at Schloss Brandis in Maienfeld. 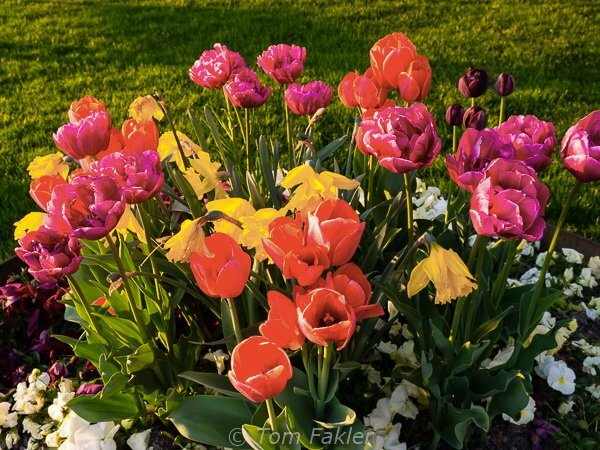 A bouquet of double tulips welcomed us to our room, where we had views of the lake on two sides, and a terrace with outdoor seating. In 1931, a ‘Neues Bauen’ extension to the hotel’s public spaces replaced earlier terrace and lounge spaces. The semi-circular rotunda is now Restaurant Rondel. A walkway provides access to the small Kurpark and the Vitznau boat station, as well as the hotel’s outdoor dining terrace. 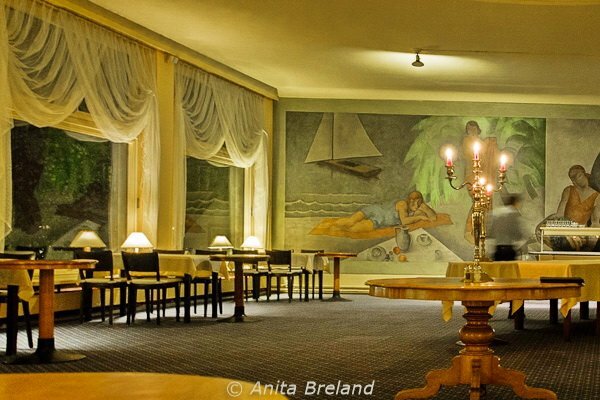 Restaurant Rondel is decorated with an original 1930s mural by Lucerne artist Eduard Renggli. Tables and chairs are from the same period, when the space served as canton Lucerne’s first dance pavilion. 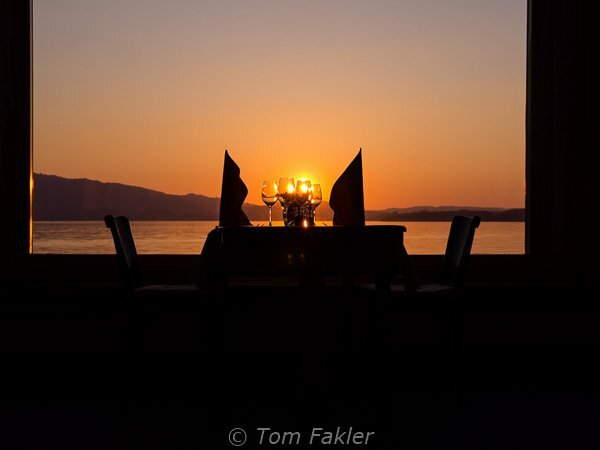 The care Pia and Roland have lavished on the hotel extends to personal services, and a memorable dinner-with-a-view. 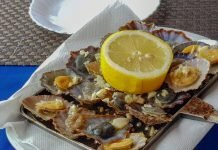 We were impressed that they source as many culinary ingredients as possible from local producers: beef, cheese and fresh lake fish, to name just three. For us, dinner and wine came with an added bonus: the story behind every dish, and each glass of Swiss wine. Wine from fortress cellars beneath the Gotthard, a port that is not called port, and a lively apertif wine from the Papal enclave of Appenzeller Innerhoden all found their way into our glasses. All 26 Swiss cantons are represented on the wine list at Hotel Terrasse –and thanks to Roland, they were perfectly paired with every course of our delicious meals, from starter through soup and main course to dessert. 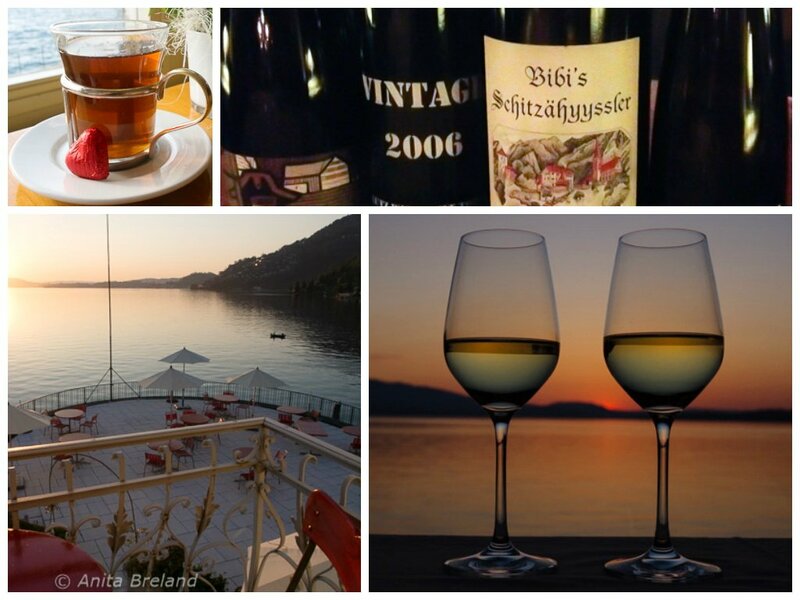 The view of the lake from the hotel is timeless, perfect to enjoy with a cup of tea or dinner with Swiss wine from the restaurant’s selection–which includes only Swiss wines, and one from every canton, to boot! 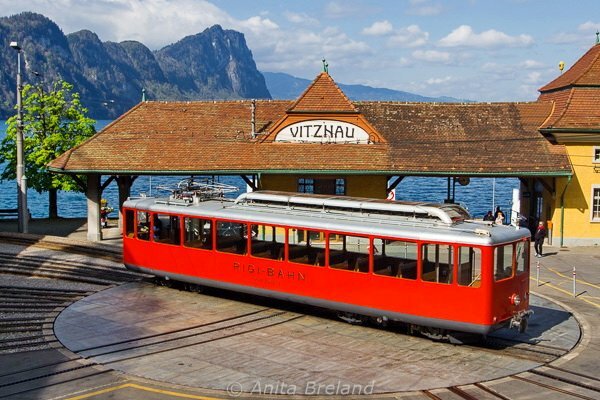 From its early days as a railway hotel, the aim has always been to offer visitors to the Rigi an ideally situated place to dine and spend the night. Hotel Terrasse am See offers much more than that. The hotel is a splendid base for exploring the Rigi, the ‘Queen of the Mountains’, and the options are many. 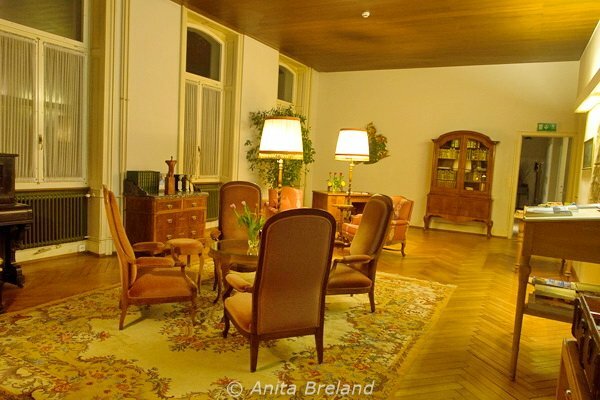 The hotel is well located for a two-hour walking circuit of Vitznau and the hills just above town, or from any of the Rigi-Bahn stations along the line. 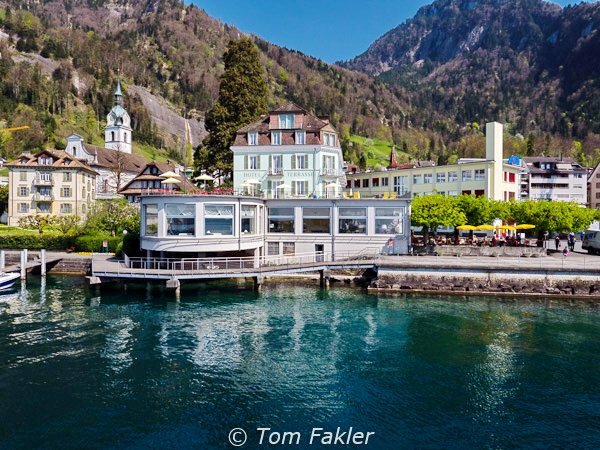 The cogwheel train departs for Rigi-Kulm just steps from the hotel , and climbs slowly through pine forests and across alpine meadows, past views that change with each bend on the journey up the mountain. 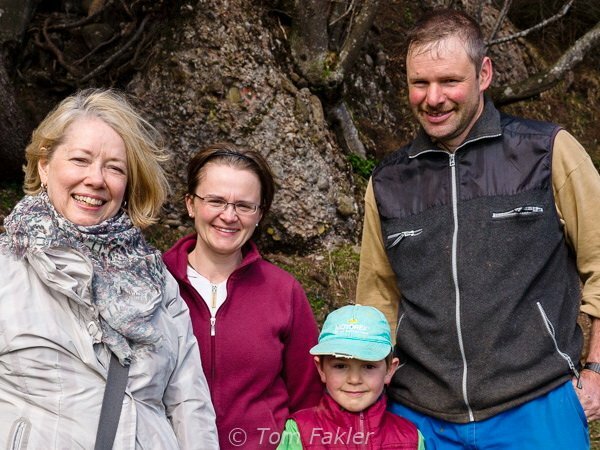 Thanks to our hosts at Terrasse am See, we were able to visit Ober Äbnet, the family-owned farm where the restaurant’s beef is sourced, as well as another farming family with a restaurant at Wissifluh. Hotel Terrasse am See has been a member of Swiss Historic Hotels since 2008. With an incomparable location, and hosts who treat their guests as friends, the hotel truly offers a ‘home away from home’, whether for a meal, a special event, or an extended stay. 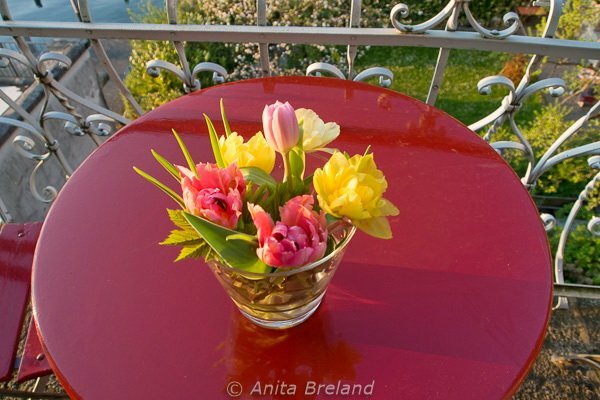 Many thanks to Switzerland Tourism and to Swiss Historic Hotels for hosting our visit to Hotel Terrasse am See. 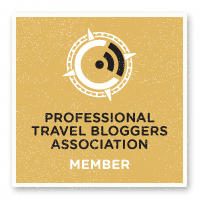 Thank you Pia and Roland Scherrer-Nussbaumer for taking such good care of us! Nice article, we won’t quite make it to Vitznau, so I’ll have to save this for another visit in the future. We are visiting mount Rigi and hiking Stoos ridge however. Thanks! Thanks for commenting, Scott. Rigi is wonderful, and the views from Stoos, unbelievable–lucky you!